A deliciously fruity and colourful strawberry mango asparagus salad, perfect for a quick summer lunch or to accompany grilled BBQ meat. It’s no secret, anyone who knows me knows that I love asparagus. When it’s in season, you can always find one or two bunches in my fridge (there was even a time when I bought 7 … yes, I’m totally the Asparagus Hoarder if you want to know my not-so-secret superhero name 😉 ) . It is a good source of vitamin B6, calcium, magnesium and zinc, and a very good source of dietary fibre, protein, beta-carotene, vitamin C, vitamin E, vitamin K, thiamin, riboflavin, rutin, niacin, folic acid, iron, phosphorus, potassium, copper, manganese and selenium, as well as chromium, a trace mineral that enhances the ability of insulin to transport glucose from the bloodstream into cells. But in addition to its many health benefits I love its fresh and spring taste, and its unique texture, how it snaps under my teeth. And the tips, mm those are tender and soft, and as I learned from Wikipedia are also called “love tips” or points d’amour. But let’s get back to my asparagus salad from the biology lesson and let me tell you about this exciting strawberry mango asparagus salad. Of one thing I can assure you: jazzed up it definitely is. 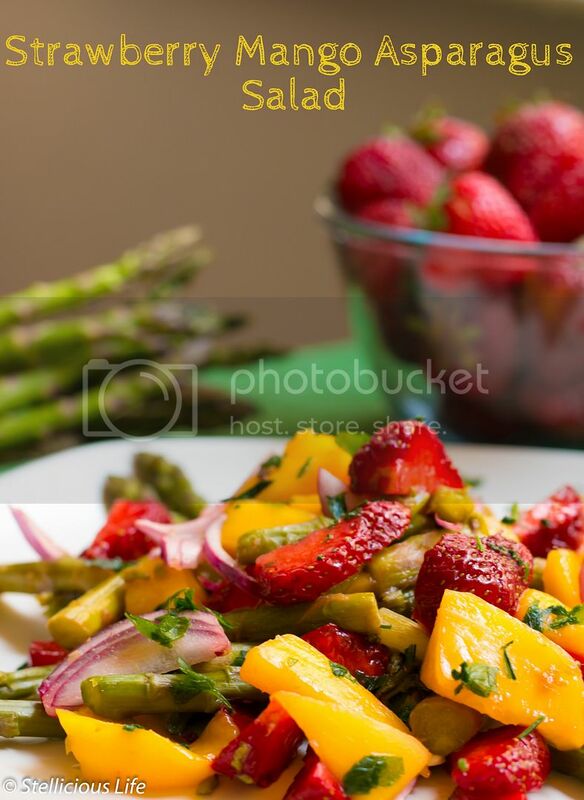 It has steamed asparagus, sweet juicy mango, fresh strawberries, crunchy red onion slices and some orange juice in the dressing to complement the sweetness of the mango and strawberry with some much appreciated tartness. 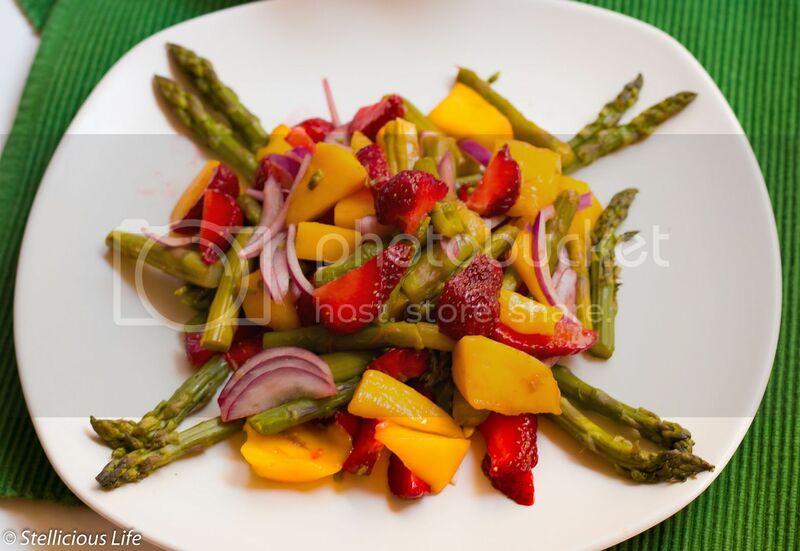 Another great bonus (besides the fact that it looks fabulous on a plate) is that this strawberry mango asparagus salad comes together in less than 30 minutes, so ideal for a quick lunch or easy dinner when you are in a rush and still want to eat something delicious and extraordinary. 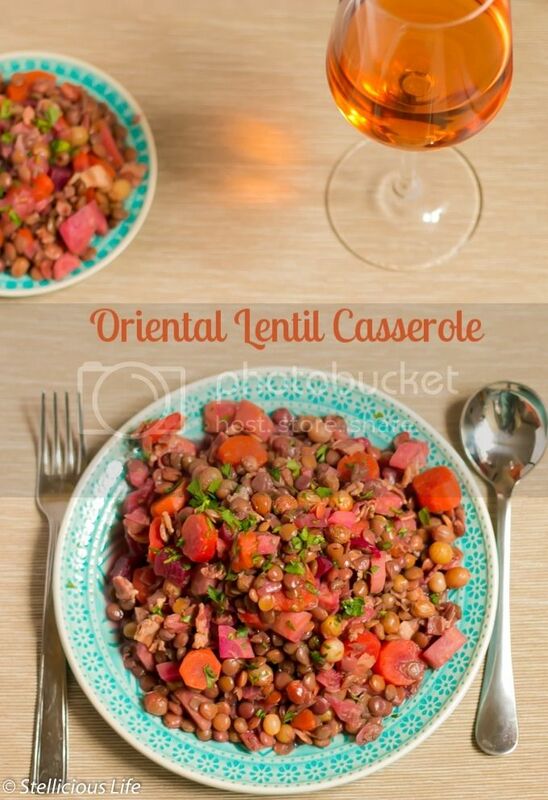 I made it vegan, but if you want, you can add some feta or goat cheese, or sprinkle it with crunchy baked bacon bits or toasted pine nuts to add more colours and textures to the salad. Wash and chop up the asparagus into 2 inch bits, sprinkle with salt and steam for about 10 minutes, until the asparagus become soft. While the asparagus cooks, cut up the mango, strawberries and red onion. For the dressing mix together the orange juice, vinegar, olive oil, salt and pepper, if you find it too sour you may add a bit of honey or coconut sugar to sweeten it. Once the asparagus is cooked, strain it and let it cool. When the asparagus has cooled down, mix it together with the mango bits, strawberry and red onion slices, pour on the dressing and mix well. Let it rest for 10-20 minutes before eating, and season with more salt, pepper or chili flakes if you wish. You may add baked bacon bits, goat cheese or feta, sprinkle some toasted pine nuts atop to add more variety to the salad's texture.